Hi. This is Gene Eckhart. You've reached the landing page for my old site, geneeckhart.com. For information the Mountain Gorillas book check the right side of this page. To see all of the other content from this website please visit my new site: www.awandererstales.com. The cool thing about the Wanderer's Tales site is that it has the book and image content that I produce but I've also added a section for stories and tales from the field. The content is important, but I want to be able to share more from the field to give you a better feel for the places, people and things contained in the images and for the people to whom those things mean so much. Let the stories touch your heart and give you pause for thought. Tucked into one of the most beautiful and conflicted regions of the world are the last of the mountain gorillas. These apes have survived centuries of human encroachment into their habitat and range and decades of intense conflict and violence. The remaining 720 mountain gorillas exist in a fragile habitat, nestled in an area torn by human interests and needs for land, water, and minerals. With captivating photography and the most recent scientific research, Mountain Gorillas takes you deep into the montane rain forests of Uganda, Rwanda, and the Democratic Republic of Congo to reveal the complex story of the mountain gorillas of the Virunga Volcanos and Bwindi. Gene Eckhart and Annette Lanjouw reveal how humankind affects the gorillas and their habitat, detail the innovative conservation and education efforts undertaken by governments and nongovernmental organizations, and explain how ecotourism and other conservation-focused enterprises support efforts to protect the two mountain gorilla populations. 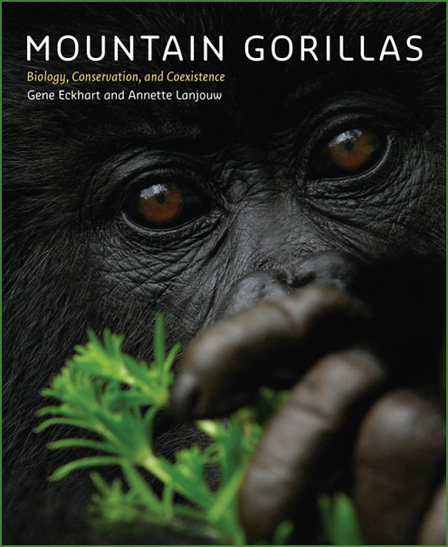 This perfect blend of intimate photography, thought-provoking scholarship, and engaging stories demonstrates the inexorable ties among the animals, environment, and peoples of the region, and makes clear why the continued existence of the Virunga and Bwindi gorillas is so important. Mountain Gorillas features stunning photos and four appendices documenting key biological and ecological information, habitat vegetation, milestones in mountain gorilla conservation, and travel information. Gene Eckhart is a wildlife photographer who has worked extensively throughout the jungles, deserts, savannah plains, and woodlands of Africa. Annette Lanjouw is the director of the Great Ape Program of the Arcus Foundation and has worked for more than 20 years on conservation of great apes in Central Africa.